Continuing to work on a Frankincense anti aging/wrinkle crème and a Frankincense rejuvenating mask from the (post distillation) gum and resin residue of different types of Frankincense. Here I am distilling the essential oils from Frankincense, Boswellia species. Successful formulation of a Frankincense Anti-Aging creme, utilizing the healing properties of the Frankincense gum and resin. Much more than just an essential oil. By “post distillation” I mean that after distilling off the essential oils, what I am left with are the water-soluble gum and alcohol-soluble resin. Since essential oils can irritate the skin, especially of the face, post distillation allows me to add a controlled amount of essential oils of my choice, isolate the water-soluble gums from the alcohol-soluble resins and remove all extraneous materials from them. The method for distillation is steam/hydro distillation using a simple home-made pot still. For a closer look at distilling Frankincense please see my post “A distillation of Frankincense Frereana”. For instructions on how to make a pot still for home production of essential oils and alcohol, see- “How to build a kitchen still for essential oils and alcohol”. Home made pot still charged with fresh Frankincense from Ethiopia. The oleo-gum-resin for this distillation is Frankincense Papyrifera from Ethiopia. Because this is an experiment I only used 2 kg. of resin. Much less than this still can process. The ratio of essential oils in each type of Frankincense varies greatly. One can collect anywhere from 0.05% to 10% essential oil from Frankincense and other oleoresins. 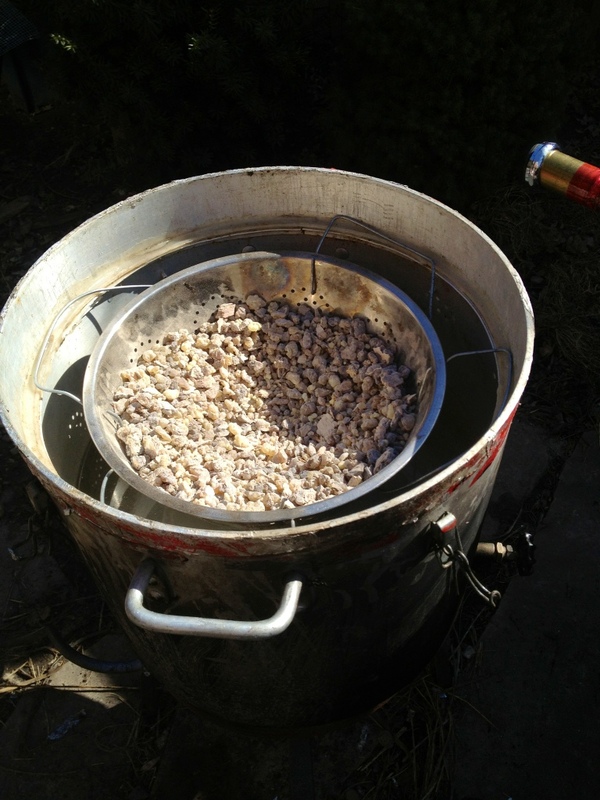 The sieve keeps the resin from sitting on the bottom of the pot where it could burn. If the resin did get burned, even slightly, the fragrance of all the components would be affected, making resin, gum, oil and residue in the still, unusable for any purpose whatsoever and no way to reclaim them or separate the burnt odor from them. In fact, on top of the loss of the material, the whole still, including over 8 feet of air-cooled copper condenser would have to be scrubbed and practically sterilized to make sure there was not the slightest remnant of burnt residue or odor in the whole distillation train. I shudder at the thought!!! I had already done this twice prior to distilling the Frankincense just the day before. First removing traces of the last essential I had distilled, then had to do it all over again because I could smell hints of cleaning products in the condenser when I turned up the heat and started the distillation process. The lesson here, I believe, is that there are benefits to using standard glass water cooled condensers. I love the fact that this one utilizes air and consumes no resources to function. But it has its drawbacks. This is a photo of the resin after distilling. Note the change in colour and texture. A pool of gum has settled at the bottom of the sieve, trying to drip into the pot through resin clogged sieve holes. Also note the milky white colour of the water after it has dissolved some of the the water soluble gums. 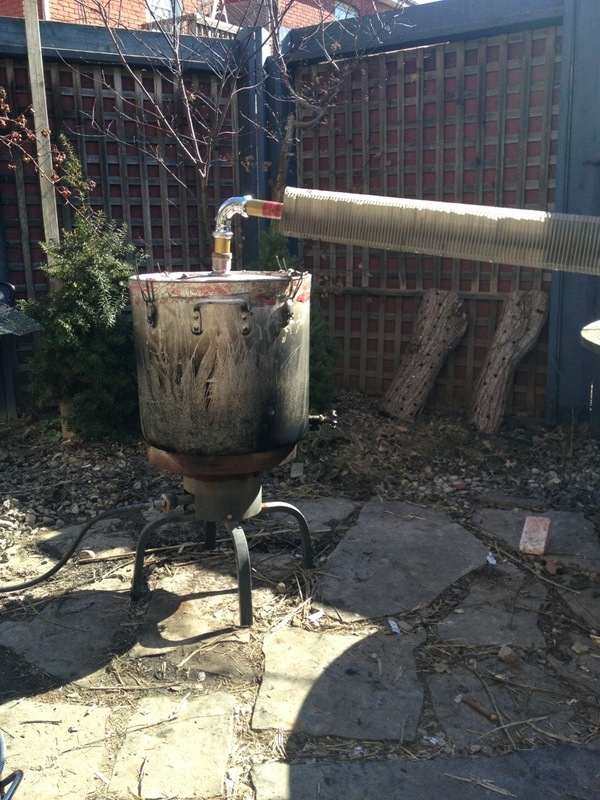 Home made pot Still. 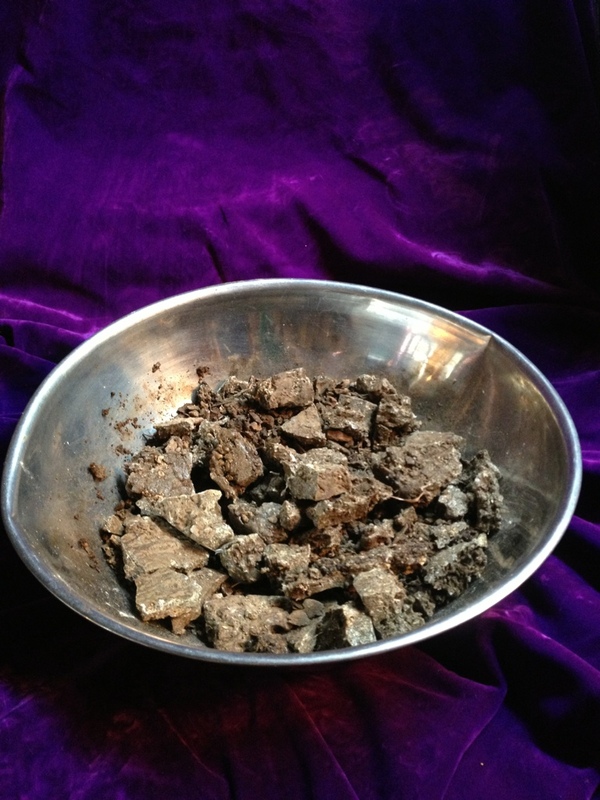 Frankincense resin suspended in sieve to avoid burning. Frankincense water soluble gum mixed with distillation water in the still has coloured the water a milky white. Now that the essential oil is distilled from the oleo-gum-resin, most of the resin is in the basket. Except for some that dripped through the sieve and formed the tastiest looking layer of caramel coloured resin on the bottom of the pot.The water in the pot is white from dissolved gum. What remains is to separate the rest of the gum from the resin, (using water as the solvent), then remove all extraneous materials, pieces of bark, stone, sand etc., and purify the components. Frankincense, Boswellia resin from bottom of still. Looks good enough to eat!! When gum and resin are separated and purified they will be recombined in an emulsion with the addition of emollient and skin nourishing oils, antioxidants, and a small amount of broad spectrum preservative. Even though the prototypes and first formulas seem to have kept well for months without obvious spoilage or mold. And even though i have a deep respect for the preserving qualities of tree oleo resins. I can’t take the chance of bacteria or other organisms growing after making an oil/water emulsion. A different type of Frankincense, post distillation of essential oils. Only gum and resins remain to be separated and cleaned. Then recombined and reformulated for skin care and healing products. Home made pot Still. Used to distill essential oils, wines and much more. Note it is made of everything including parts of the kitchen sink, with a salvaged copper/Aluminum heat exchange as an air cooled condenser..
Distilled Frankincense essential oil. Boswellia Rivea. 2013. Hi Wayne. There are different grades of B. Sacra available. The higher grades are the rarest and dearest. 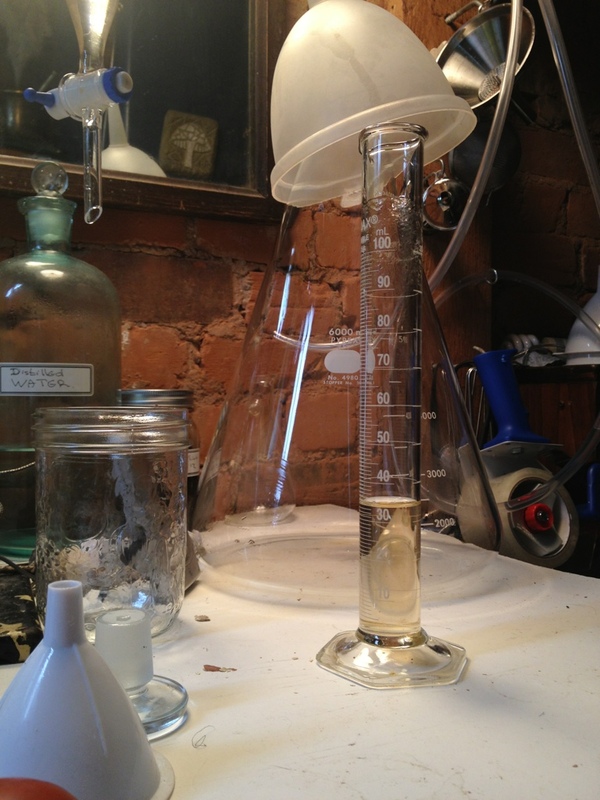 For distillation the lower grades are most often used and the resin can be purchased in bulk at a reasonable price. The average yield of essential oil from this resin is about 5% so from one kilo you could expect about 50 Ml. Or an ounce and a half of essential oil. A kilo is a little over 2 pounds. What can I do with the cloudy water left over? Hi Megan. The cloudy water with the gum contains the bitter principle of the Frankincense. I haven’t found a use for it yet besides adding it to bathwater. It can leave a sticky residue on the skin and doesn’t keep well. It should stay frozen or refrigerated if you plan to experiment with it. Which gums and resins do you process in Yabello? I believe you are in the Borena, Oromia area? Oh, and in ignorance, I did just what you said above and drained out the liquid and kept doing so until no more was being released and what I had left was the gum, which I tried chewing. It still tasted like postage stamps, but it wasn’t awful. Before I knew the bag of mystery stones I bought in Doha was frankincense, I was told it was not incense, and the way the locals were using it was to soak some of the tears in a water bottle until it turned milky, then drink it to relieve respiratory ailments like sinus, coughs, sore throats and colds. I tried this for my grandchildren, but the flavor was like very strong postage stamp glue, so I added lots of honey and lemon to disguise the taste. As it turns out, the milky substance is also an emulsifier, so the mixture did not separate. 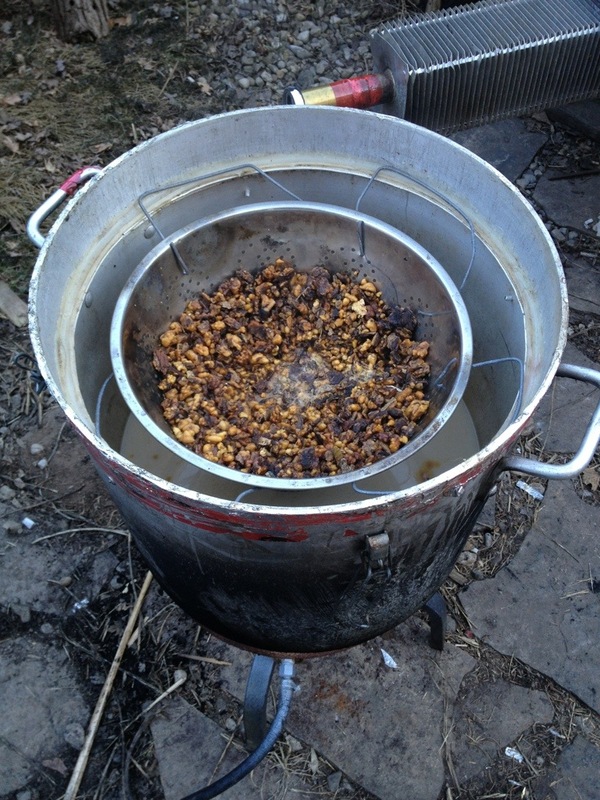 I was able to give them big dropperful of the mixture, and it really did calm their terrible coughing for a time. I guess no part of this precious substance is to be wasted! It is very easy actually. Just go to wordpress.com and start a blog. Let me know if you have questions after that. Hi, I’m writing from Canada. I don’t know what the situation is where you are, but the quality of frankincense available has been diminishing over the years… becoming less and less pure. It’s almost impossible now to find good, clear frankincense, that gives a pure scent when burned. 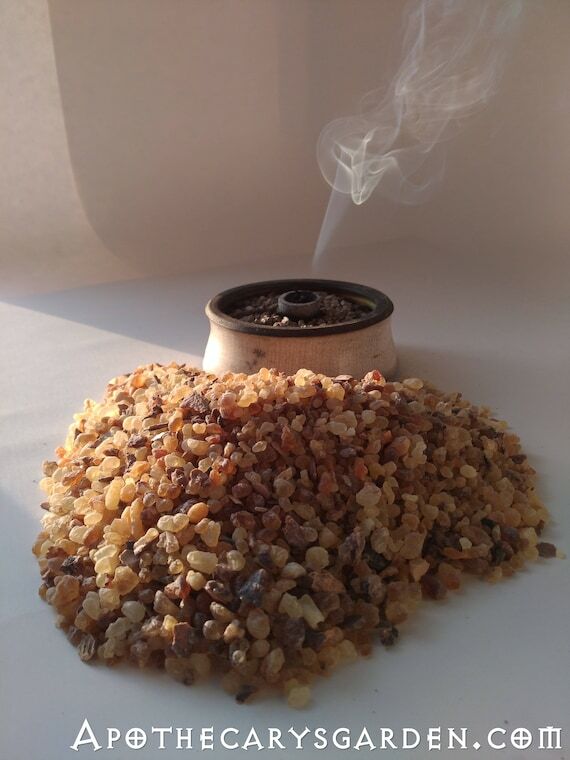 I’ve heard that there is a way of removing some of the impurities of the darker, coarser frankincense that is available to us here and– keeping it in solid form for incense– without distilling it to essential oil. If you have any idea how I would go about clarifying frankincense, I would be very grateful for your advice. Thanks for your interest and your question. The quality of Frankincense Sacra/Carterii resin we have become used to, does indeed vary. I agree, the quality is getting lower. There are reliable suppliers out there, but it often takes a lot of trial and error to find one. I believe the clearer “tears” are separated, graded,(given names! ),and sold at a premium, they don’t reach us as often and are quite dear when we can get them. They are clear because they usually contain a higher ratio of resin and essential oils and less water-soluble gum. The lower quality and cheaper tears are more opaque, often almost white in colour and have a lower resin and essential oil content and more water-soluble gum which yields less aroma and a poorer fragrance when burned. The gum, which is present in most types of Frankincense, is what gives the charred smell after the resins and essential oils have dissipated. Beyond this issue, there are now a few different types of Frankincense that we couldn’t get in Canada till the past decade or so. Each has its unique chemical composition and odor. Though different than what we are used to, they are highly prized. Some of the rarer types of Frankincense such as Boswellia Neglecta actually are valued for their dark resinous nature. Some types are collected as chunks rather than tears. O.K. to answer your question, If I am correct in assuming, the impurities in your Frankincense resin you are referring to, are not from extraneous materials, foreign objects and dirt, But due to poor quality Frankincense tears that are whitish, not transparent or translucent, and have inferior fragrance due to a high water-soluble gum content, then I believe you can indeed “purify” your material and transform it to a high quality solid incense resin with the method below. Though it is always easier to start with good quality material, as you point out, this is not always possible. Freeze then grind your resin to a powder in a pre-cooled coffee grinder. 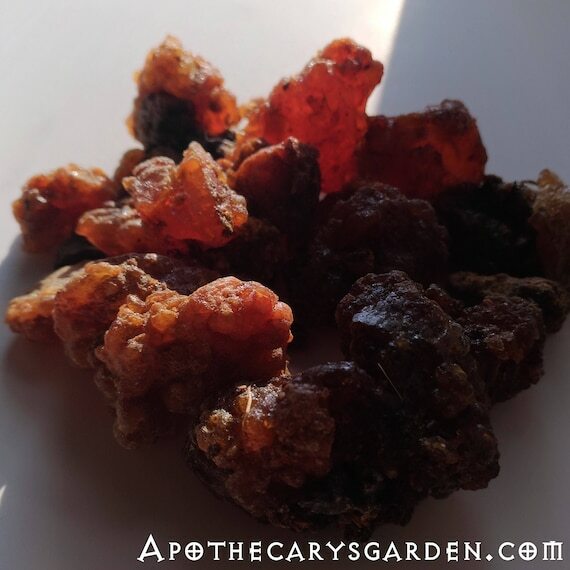 (Have a look at my post, “How to grind Frankincense and Myrrh”), Mix it thoroughly with lukewarm water in a clear glass beaker, or mason jar, let the resin part settle, then carefully pour off the cloudy water. Add fresh water stir for a while, let the resin settle,and repeat. and keep pouring off the white or cloudy water, adding more fresh water, mixing, letting the resin settle, and pouring off the cloudy water, and repeating the process till the water no longer gets coloured or cloudy no matter how much it is stirred. It will take a while!! At this point the residue you have left on the bottom is all and only pure resin. You could spread it out to dry, then break it into chunks, or let it partially dry, then roll it into balls for instance, (Keep them in a nice container? ), and then use them as a pure incense. The burnt smell that Frankincense emits at the end of its smoldering on the charcoal is from the water soluble gums it contains. If you “wash” out all the water-soluble gum as described above, you would have a very pure frankincense containing only resin and essential oils that would not emit that charred smell. It would simply melt into your charcoal and leave no carbon or ash. This would be a very pure fragrant resin. 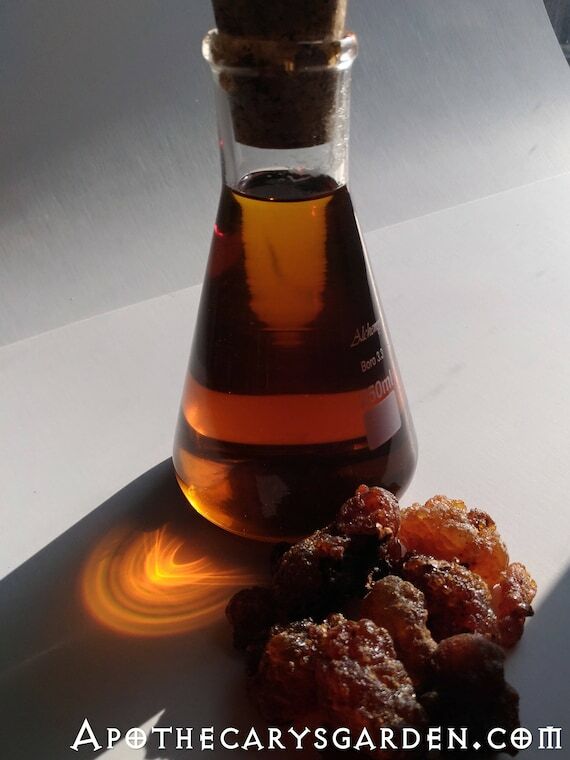 As far as I know, till recently, in our Canadian market, (I am in Hamilton), we could only get Frankincense in “tears” from Boswellia Sacra/Carterii which came from the horn of Africa, Oman and Yemen. So I am going to assume we are talking about the same variety of Frankincense. I hope that helps Ryan. Please let me know if you try the “purifying” method or if you have any further questions. Thank you so much Dan! That’s exactly the method I was searching for, I’d forgotten the details of it. I will definitely let you know how it goes. What an interesting process – alchemy lab for sure! How do you draw off the essential oil? Could you include some in my myrrh package when you send it? Your frankincense anti-age creme pre-Ethiopia is lovely to use on face and hands, and the post-Ethiopia results must be something of a landmark for you … new horizon. The plant and tree memory is in these distillations. The thought which goes into them combines with nature. Nature’s technology is slow and thorough. Mechanical technology is a forgettery. I wonder if the commercial product is analogous to speeding up the human voice and therefore distorting it. It feels much the same as when you drew that 16th century drawing of “Midwives and Astrologers”,in your last post from “scratch”,so you could know it, experience it, and share that direct experience. With wholeness. I have been meaning to comment on that “Artful” and smooth move on your part. You keep adding more layers and dimensions of meaning to chicken scratches that we are all used to perceiving in 2or 3 dimensions at the most. I love how you became one with it, and it with you, gave it a new body, re-birthed it, the words, the story, the post, the whole thing “delivered” while part of you is always standing looking, pointing out the window, in wonder of the stars and astrological climate. I would love to send you some of the same Myrrh tincture I have been using. And though the yield from the Frankincense Papyrifera was minute,as the professor warned me! ), there certainly is enough to share with you. I have finally packaged my “Dafdodill foot Creme” or heel Balm. Will send you a sample. I will contact Genie on Facebook and see if there is anything i can include for her and spread the shipping costs a bit. Thanks as always Jane for “Getting It”.